Strolling up Main Street U.S.A. at Disneyland, one can’t help but hear the sounds of ragtime music drifting from the Refreshment Corner where there sits a pianist tinkling the ivories on one of the most played pianos in the world. The Yamaha model YUS1 upright the pianist plays has been faithfully making those melodic sounds since it was placed there more than five years ago, the latest in a long line of pianos at that spot for decades. “These pianos will get played hours a day,” said David Durben, a piano service specialist with Yamaha Corporation of America. Yamaha supplies all the musical instruments at the Disneyland Resort, and that includes pianos of all kinds, from grand pianos in settings like the Grand Califonian Hotel, to the one at the Refreshment Corner, where it sits, most days, outside — meaning the weather is a major factor in how the piano sounds. “There’s a great deal of wool felt used in the piano’s moving parts, like its hammers. That wool felt swells and shrinks with the heat and especially with the humidity,” Durben said. That humidity makes the felt heavier, and the piano harder to play, but the show must go on; the pianists know that on those days, they just have to play the keys harder. While Disneyland specialists constantly maintain the piano, keeping it in tune, sometimes something, like the shank for a particular note’s hammer, will break. But that doesn’t put the piano out of action for very long. “We provide Disney with spare parts. They can change out whole key sets in a matter of minutes,” Durben said. Then the whole key set can go back to a shop for more extensive repairs while the pianist starts playing again. The music they play ranges from ragtime, with the most requested song being “The Maple Leaf Rag,” according to “Ragtime” Robert Gillum, one of the regular pianists. Besides ragtime, they also play many Disney songs, and when those are played, many visitors will start singing along and even make requests for specific Disney songs. “‘Part of Your World’ from ‘The Little Mermaid’ is one of the most popular, and usually the girls who want to sing that, can sing, as they’re theater majors,” he said. The ragtime pianists Disneyland employs are not the only ones to play the piano. Sometimes a guest will ask to play the piano, as 11-year-old Lacey Fuller of Plumas Lake, Ca., recently did when she stepped up to ask Gillum if she could try her hand at playing it. He stepped out of the way as she sat down and started to play a ragtime tune. She did so well that she earned herself some applause from Gillum and the crowd around the piano. Gillum gave her a card with her name on it congratulating her on being an authentic ragtime pianist at Refreshment Corner. Was this your last recollection of what a player is? While it might be entertaining, probably not what you’d envision in your own living room. At least not for more than a weekend. Yamaha has been at the cutting edge of player piano technology for over a quarter century, transmogrifying the cartoon of our childhood memories into an elegant, subtle work of art that can recreate the favorite songs of your most beloved artists right down the velocity of the original keystrike. Introducing the Disklavier: true acoustic pianos that incorporate fiber optic sensing systems, high performance solenoids, and state-of-the-art computer technology. These pianos can very accurately record piano performances and play back with all of the expression and nuance of the original performance. These instruments have many capabilities that provide a wide range of entertainment and educational uses. The Yamaha Disklavier E3 combines technology with tradition to open up a whole new world of musical possibilities to explore. The E3’s innovative features help you find your own customized way to relax. When you pick up the remote control, you are instantly ready to enjoy new music over the Internet or listen to an old favorite from your personal CD collection. The E3 also comes with built-in speakers as well as exclusive Yamaha CD’s, allowing you to start listening right away without a complicated set-up process. And no matter where you live, when you connect the E3 to the Internet, you gain access to a treasure trove of musical performances from the finest musicians in the world. To learn more about Disklavier pianos, click here. Marilyn Rocky of Little Silver is a little off-key when it comes to the house at 7½ West End Court in Long Branch. You see, she owned the house when Bruce Springsteen was the tenant there in 1974 and ’75, and when she sold the house 20 years ago, something was lost in the transaction: the piano Springsteen wrote “Born to Run” on. Springsteen saxophonist Clarence Clemons told Rocky that the band had signed the instrument under the lid. This was news to Rocky. She had left the piano, a small spinet Springsteen had brought when he moved in, with the house’s subsequent tenants. It had remained in the living room for 20 years. Meanwhile, “Born to Run” made the band stars and put the Jersey Shore on the musical map. After 300 Years Of Evolution, Has The Piano Reached Acoustic Perfection? The modern piano evolved rapidly in the first 150 years after its invention, but it is now so good, acoustically, that it probably won’t change much more in the future. That’s the conclusion of acoustician Nicholas Giordano, dean of Auburn University’s College of Sciences and Mathematics in Alabama. He described his work last month at a meeting of the Acoustical Society of America in Jacksonville, Florida. Giordano’s interest in the instrument dates back to first learning how to play piano as an adult, when his teacher introduced him to Baroque composers like Bach. Giordano decided to build his own harpsichord so he could play Bach on a period instrument, thereby experiencing what the music sounded like in the composer’s era. He enjoyed the project so much that he kept at it, acquiring early pianos and rebuilding them in his spare time. His collection now numbers 21 instruments, the oldest of which is a close relative to the harpsichord, the bentside spinet, dating back to 1703 (when Bach was just a teenager). That experience has given him valuable insight into how the instrument has evolved from its earliest days. Bartolomeo Cristofori, instrument maker to the Medici family in Florence, Italy, built the first piano 300 years ago. It was very similar to the harpsichord, except with a harpsichord the strings are plucked (like a guitar), and with the piano the strings are struck with a hammer. Christofori figured out how to control how hard the player could press the key, thereby varying the volume of each tone. Instrument makers spent the next three centuries improving on this design. According to Giordano, the earliest pianos only had 49 notes, covering four octaves. It was good enough for Bach and his contemporaries, but Mozart might have found that range a bit too limiting; by his time, the range had expanded to five octaves. Later composers like Brahms and Rachmaninoff composed for pianos “powerful enough to play with a full modern orchestra.” In addition, the modern piano design also has better “action” than those earliest instruments — that’s the mechanism that connects the key level to the hammer, which strikes the strings. It’s faster and more responsive today, which means the performer has much greater tonal control, further enhancing the expressive possibilities. Louder sounds meant more reverberation, and led to stronger cases: metal plates are now added to strengthen the case. Modern pianos have seven octaves (plus a minor third, for a total of 88 notes), and that’s where it’s stayed for the last 150 years, even though the human ear is sensitive to a much wider range of frequencies than those covered by the piano’s keys. Giordano thinks this is because of how human beings perceive notes beyond the piano’s range. Below that range, most people hear the notes as decidedly un-musical clicks. Above the piano’s range, we can’t pick up combinations of two or more notes to form chords. Posted on December 3, 2015 Author PJ OttenritterCategories Piano History, Piano NewsLeave a comment on After 300 Years Of Evolution, Has The Piano Reached Acoustic Perfection? Under the headline “Signs of Summer” in 1916, the New Castle, Del., Herald listed: lollipops, robins, bare feet and street pianos. Yes, in the 19th and early 20th centuries, street pianos were everywhere. Their perky, plinky, preset music — playing the same songs over and over — filled the air in towns across America. 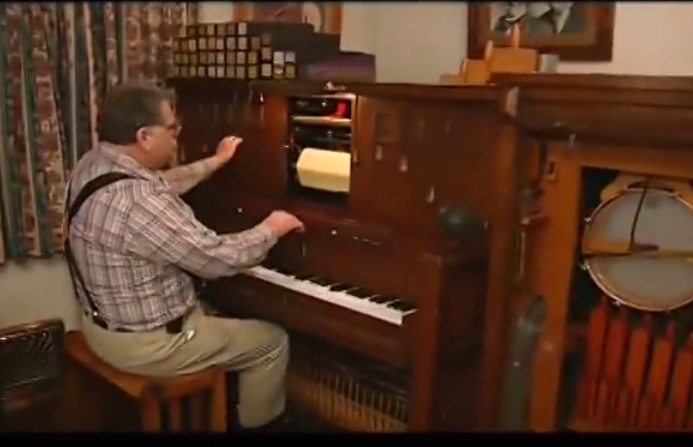 Often mounted on wheels or on a monopod, the wooden-cased street piano or barrel piano or barrel organ — the terms were sometimes used interchangeably — came in several sizes. 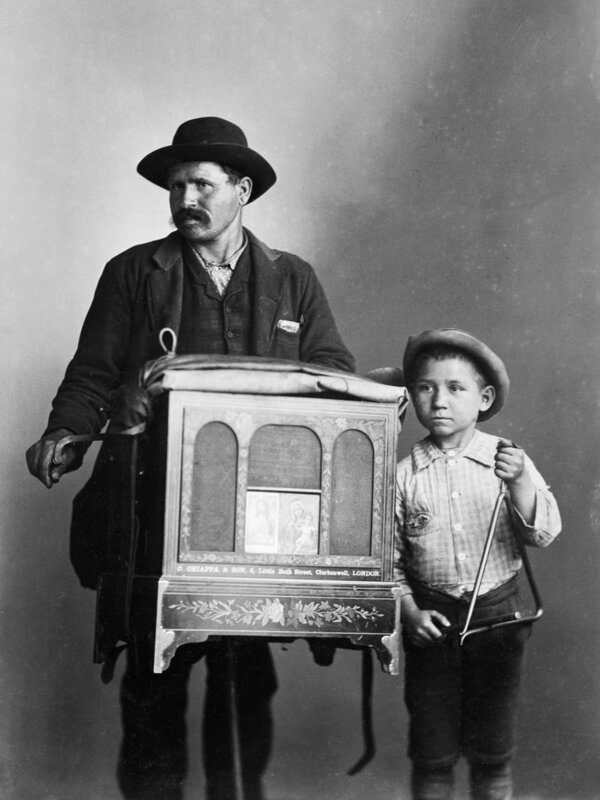 Like a portable player piano, the street version was usually operated by a hand crank, and it played prefab popular tunes, such as polkas, quadrilles, waltzes and show songs. “When the piano man arrives before your door there instantly gathers from the thin air a crowd of children, and when the music begins off they go, up and down the smooth pavement, dancing to the music,” a Washington bureau reporter of the Saint Paul, Minn., Globe wrote in the spring of 1892. With its origins in Italy, the street piano’s salient feature — for better or worse — “was its loud tone to be heard above street sounds,” according to the 2004 book The Piano: An Encyclopedia. By tradition, many of the pianists, or organ grinders, as some of the players were known, were from Europe. Both men and women operated the instruments. Some Americans hated the rinky-tinkiness and repetition of the street piano. “It is a dull crowd the organ grinder appeals to,” observed the Reading, Pa., Times in July 1898. In some hamlets — such as Allentown, Pa., and Brooklyn, N.Y. — organ grinders were fined or arrested because they refused to stop playing. The city of Somerville, Mass., declared “war on organ grinders,” the Fitchburg Sentinel stated in September 1893. Other Americans loved the lilting, uplifting tunes, wafting through the breezes, and traditionally showed their appreciation with tips. Small children, companions or, most famously, leashed monkeys sometimes accompanied the grinders to collect the money after songs. In New Bern, N. C., for instance, the Spectator reported in 1838 that a strolling Italian musician had been hanging around for a couple of days “and was pretty well remunerated for the entertainment he afforded by playing on a portable barrel piano which he carried through town.” A few days after leaving New Bern, the story swept through the village that the musician had reportedly been murdered in Waynesboro, N.C., “and that his piano had been found in the woods, broken and useless.” Turns out the latter part of the tale was true, but not the former. A stage coach driver subsequently saw the man, staff in hand, some 30 miles north of Waynesboro. On July 4, 1902, an Italian-American street pianist from Philadelphia was charged with murder for shooting three men in front of the Crystal Palace Hotel in Reading, Pa., the Harrisburg, Pa., Telegraph reported after the celebrated case was tried. The piano player — who entered a self-defense plea — was acquitted because witnesses said the three men had harassed and assaulted him first. When an organ grinder arrived in Richmond, Va., in 1905, The Washington Post reported at the time, he was arrested for “owning” a “human monkey” — a man who had been disfigured in an industrial accident.